Fun fact about me: I'm not really into Halloween. I don't do scary at all. In fact, I've been known to burst into tears if someone tries to jump out from behind a corner and surprise me. I just really don't like to be spooked! But my kids, especially Moose, are starting to be excited about Halloween right now. So since I can't escape it, I thought I'd do more of a silly spin on a Halloween classic and make some quick quilling paper bats! This post contains affiliate links. If you click on the links below and make a purchase, I may receive a small compensation to help me finance this site and keep coming up with awesome tutorials and tips! There's no cost to you and I only ever include links to companies and products that I trust and work with on a regular basis. These bats are perfect for a craft to do with kids. Plus, they're great practice for some shapes that aren't used that often in quilling! To make each bat wing, roll 3 coils of 17" strips of black quilling paper, like Quilling Creations Black. I let 2 open just slightly, but the last, I let relax just a bit more. These coils will turn into the three sections of one wing. Each will needs to be pinched into a triangle. Just a reminder, to make a triangle. pinch one side of a coil. Then, with both hands, squeeze the other end to form 2 more points. To get the rounded bottom, push the shortest side of each triangle against the handle of your quilling tool. The larger coil will make a slightly bigger triangle. This will go on the end of the wing, to give it a more open, natural look. Line your triangles up, add a few small dots of glue between them, and pin until dry. I like a finished look to most of my quilling, so I wrapped the outside of the bat wing with another strip of black. Repeat all the above steps for the second wing. Don't forget to move the largest triangle to the other side on the opposite wing! While the wings dry, roll a tight coil from 3 strips of black paper. This will become the main body/head of the bat. Like I said, these babies are meant to be more cartoony, than anatomically correct! I made mine slightly domed, but that's completely optional! I also added some sweet, tiny ears from a teardrop made from 1" of black paper. Once all the elements of your quilling paper bats are dry, glue the edge of each wing to the side of the body. I thought about adding eyes, but I wasn't happy with the results, but I had to make sure they had teeny bat fangs! To make them, cut a small square of white paper, then cut that on the diagonal to make 2 equal triangles. Add a touch of glue and place each fang on your bat. I love how they sort of look like they're smiling when the fangs are glued at an angle. 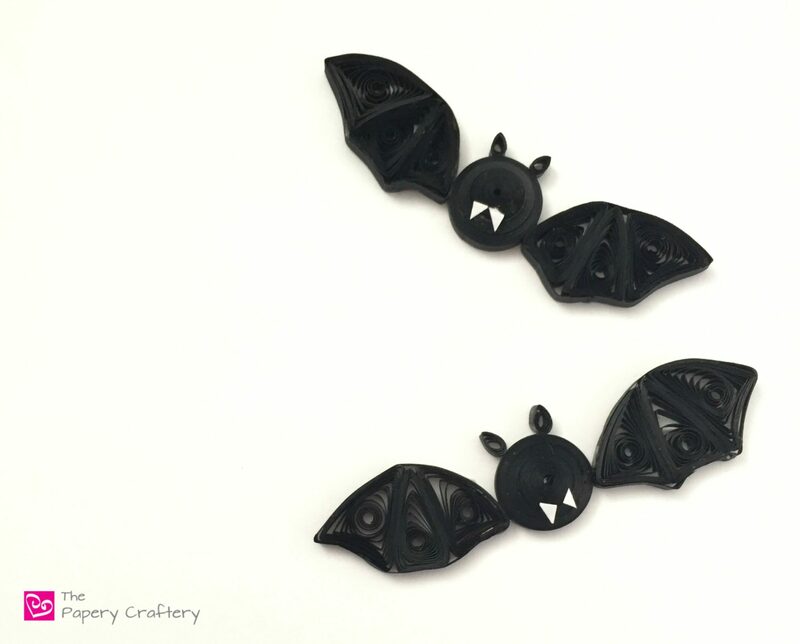 Simple, cute and quirky ~ these quilling paper bats are the type of Halloween decorations I can get behind! I'm thinking of stringing a few of these quilling paper bats together and hanging them like a little bat garland, but they would be ideal for a Halloween card. They could maybe even be added to some of those faux carvable pumpkins for Halloween decor that could be saved year after year! I hope you'll give these bats a try and check out some other not-so-scary paper crafts that I'm finding on Pinterest! Hi Meredith, saw your bat this morning and decided to make one my sister-n-laws Halloween box. I put tiny tiny red rhinestone s as eyes. Looks awesome. Thank you for the idea. Hooray, Marla! I was so late with this that I was afraid no one would be able to use them before Halloween. I’m so glad you made some! Love the rhinestone idea!